Place five shrimps on a skewer. Heat a grill pan over medium heat on the stovetop (outside grillworks too). Once heated spray pan with cooking spray. Baste each side of the skewer with the Olio Apricot Jalapeno Pepper Jelly. 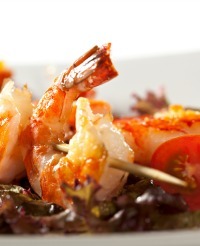 Place shrimp skewers in pan and cook 60 seconds on each side (until they are pink). Place directly on plate - baste lightly with pepper jelly and sqeeze lemon on top.